The key words in the title of this essay are quality and industrialisation. I will look at the implications of both these words in the public sector generally (as the changes being implemented are affecting all aspects of the public sector) but with a focus on higher education and with reference to medicine. The world is constantly changing but the mid 18th century saw the most substantial change with the industrial revolution. This effected how the majority of the population lived and worked. There have been other changes since then including the move to service industries, the introduction of communication and information technology, increased specialisation and automation and the shift from the unquestioned respect of “the professional” to the need for all to be accountable. Historical the professionals have monitored themselves – the professional bodies e.g. Universities and Royal Medical Colleges had autonomy. This is no longer considered acceptable and the need for transparency and accountability is called for. In the 1980s the development of the new public management had a major impact on the public sector. The public sector started to utilise the practices of the private sector. This demonstrates as management by regulation with the government running the organisations. There are two major problems brought about by using a methodology developed for the industrial/commercial sector in the public sector. Firstly, the definition of the product. In industry it is the toilet roll, the concrete block; the fighter jet. In the public sector the product is not so easily definable – it could be a person (student, client, patient); or the social benefits brought about by a well education and healthy population; or a society that is more able to deal with a globalised market. 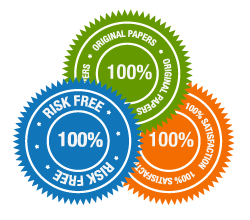 In education the product can also be defined as the degree awarded. The second issue is the raw materials entering the production line, in the public sector the quality and quantity can vary randomly, whereas, in most industrial settings this factor is highly controllable. The market forces now drive the food we eat, specifying “how round”, “how red”, “how straight”, “how clean” our food is. There are cost implications to this so it is often the indicators that are easy to measure which are used – so for food it is the size, the colour, the weight that are the indicators, although the element of most importance should be the taste – but it is not so easy to develop an indicator for that. In the public sector is quality decided on easily measurable things or what is important ? (Ovetveit, p103). This section will briefly summarise the changes brought about by industrialisation and how this has changed work practices. The way people worked and where they lived changed radically due to the industrial revolution. Previously people had a degree of power over their means of production however small. As a result of the industrial revolution there was a dramatic decline in workers who owned their own land, tools, work premises or capital (Holden). From the mid 18th Century workers were no longer tied to land and moved around to find work. People now worked in large centralised workplaces. In order for those workplaces to run efficiently the worker had to arrive at the same time and work for the same time and life became dictated by time with imposed time and work disciplines. The products the workers made where sold for profit so the standard of the product became important. In the agriculture and textile industries waged labour was well established and the putting out system1 had instilled a discipline to produce goods to fulfil commercial demand (Holden). There was an increased dependence on waged labour and a decline in the worker’s autonomy of the product. From the 1920s quality control and assurance practice was developed, this took the form of replacing faulty products (Joss) and the identification of defect rates, particularly in the agricultural industry (Powers). In the first instance one of the shop floor workers would be pulled off the line to ensure the standard of work was appropriate – that each widget was the right size, weight, colour etc. In time this job became more important and the factories employed people specifically to monitor the standard. Quality assurance evolved following the Second World War when pre-production elements were tackled so that faults were eliminated from the process before it started (Joss, 1995). This changed the practice of the workers, with more unskilled workers doing repetitive tasks, on one area of the production line, instead of a skilled worker overseeing the whole production (Joss 1995). The 1950’s brought about the quality revolution in Japan, that has had a great influence on industry globally. Initially they concentrated on variations in the production line which caused problems, this developed into a change in employee attitude by actively motivating and developing staff (Joss 1995). At the same time consumerism was developing which can be demonstrated in the UK by the setting up of the Consumers’ Association in 1957 followed by the National Consumer Council in 1975. There was a move, in management terms, away from the production line to management structures as can be seen in Taylorism and Fordism. Both introduced programmatic interventions. Taylor introduced incentive payments, monitoring systems and standard operating practices (SOPs) which moved the factory into a mass production unit (Zuboff). So in just over 100-150 years work changed from being something that most people had ownership of to the mass production unit where being able to produce the right number to the correct standard, in the time allowed, is the imperative. The mid 1980’s saw the New Public Management, in response to a demand from politicians for improved accountability in the public sector. 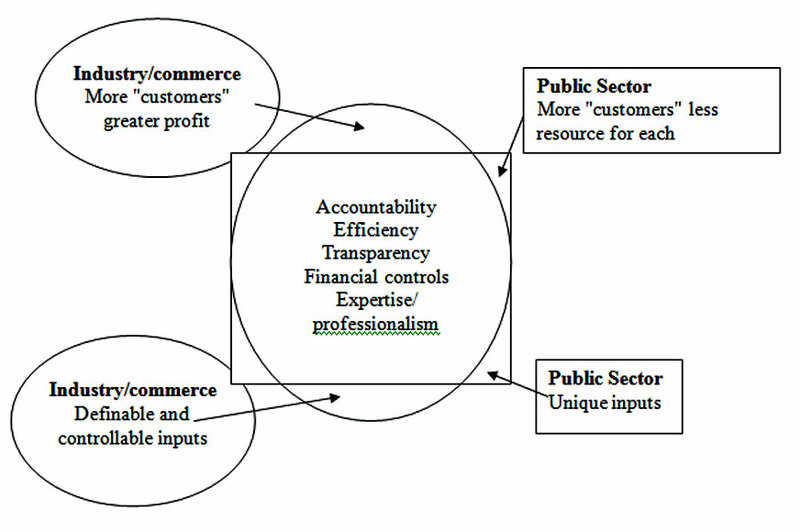 This took ideas from the private sector administration, such as : cost control; financial control; transparent budgeting; the creation of markets and quasi-markets to separate purchasers and providers with costs attributed to outputs not inputs; and the accountability to customers for quality service by the introduction of performance indicators to measure outputs (Powers (), Clarke and Newman (). This brought about the concept of value for money in the public sector and the rapid introduction of audit. The purpose was to change the culture so that the public sector became cost effective, efficient and had quality embedded through the use of audit (Powers). Financial rewards were based on the achievements devolved. What is quality ? Many people have tried to define it and have come up with a variety of opinions. Some say it is not worth trying to define quality, others would say it can be defined as effectiveness (Handy); of a standard (Powers); excellence, conformance to requirements (Middlehurst); fully meeting the requirements at the lowest cost and customer satisfaction (Øvretveit). Donabedian ( ) questions whether quality is one aspect, related aspects, or a group of heterogeneous aspects brought together by their use. Does quality follow the Kaizen principle that all our lives deserve constant improvement ? Or is quality not about introducing new systems but about changing human relationships (Øvretveit). Clarke () argues that because quality is linked to professional concepts it cannot be fixed or stabilised in practical terms. Another problem area is who decides the quality. This had always been the province of the expert – the professional, but now the customer and the client are brought into the discourse. The likelihood, in many situations, is that the professional and the client/customer will approach the issue of quality from entirely different standpoints (Clarke ). If the client/customer is the only, or main judge of the quality this in itself can cause problems (Readings ). Ovretveit ( ) identified a series of important factors when addressing what the customer wants from a quality product : reliability, responsiveness, competence, access, courtesy, communication, credibility, security, understanding, physical tangible (environment, appearance of staff). Quality is hard to define and is highly subjective in its nature. How then can quality be embedded into the public sector ? Audit is now well established as the way to assure quality. In the late 1980s the National Audit Office and the Audit Commission were established and audit began being promoted everywhere. This was not only the start of the Audit Society but of the blame society with audit shaping public conceptions (Powers). The outside rigour now impacted on public sector groups, education, health, local government in the form of audit and all faced changes (Powers). The Government has always provided financial support to the public sector to greater or lesser degrees. The free rein provided by this financial support now began to be restrained. Audit developed from financial audit and brings with it many elements of that financial audit. Financial audit looks to the past, not the future, the auditor’s attitude is one of caution and risk avoidance. The audit will only include what can be counted. This will miss out intellectual assets, know-how, good will – the culture of the organisation (Handy). A major issue, that is particularly important when an industrial method is used in the public sector, is that people may be counted as costs – rather than assets, this means that, when trying to cut costs the assets are lost (Handy BC 139). Many doctors, like many other professionals, were not enthusiastic about the requirement for and subsequent introduction of quality assurance. However, in the 1980s there was a realization that service quality and client satisfaction had to be addressed (Walshe). Audit then became part of every day life for all doctors. The Department of Health provided both guidance and money. Medicine looked to what had already happened in audit and quality assurance. It was hoped that they could learn from past problems. Walshe ( ) provides six areas to be addressed : Credible; relevance; practicability; comprehensibility; triangulation; generalisability. He also draws attention to the problems that arise when setting goals and objectives. Everyone : the purchasers; the providers; and the users have to be involved and have their own possibly diverse and opposing opinions. Walshe () sets out three problem areas in medicine, but he could as easily be writing about education. There are problems defining quality in the public sector rather than industry because of the complexity of healthcare; the problem defining customers and customers requirements and the existence of additional non-commercial dimensions. In Higher Education the Academic Audit Unit was established by the CVCP in 1990 to introduce a formal external quality assurance to UK Higher Education, in response to the 1987 White Paper, “Higher Education; Meeting the challenge”. In 1992 the Further and Higher Education Act re-designated polytechnics and abolished the CNAA and the HE inspectorate. The Act lead to the establishment of the HE Funding Councils in England, Scotland and Wales to monitor quality and value for money. Each Council had a Quality Assessment Division – Teaching Quality Assessment (TQA, subsequently known as Subject Review) looking at subject assessment of funded programmes. Concurrently, the HEQE – Academic Quality Audit Programme was initiated by the CVCP’s Academic Audit Unit (Brown). In March 1997 the QAA was established in response to the concerns recognised in September 1993 that there was duplication in the two processes of the HEFE and the HEQE. It is easy in education to count the number of people attending, the number of people completing the course, the grades that they attain – the outcomes. This is very much the concern of industry. The process is fairly unimportant in an industrial setting as long as the law is not broken or the cost too high. However, both in education and medicine the process may be as important, if not more important, to the person involved. But, it is much easier to audit the outcome than the process. A by product of the introduction of the quality discourse is the league table. Some data are well suited to league tables ; the number of CD-ROMS produced each month; number of trains that run on time each month, the number of hits on a web site. But can outcome data for schools, hospitals and universities been considered of any value, unless the data takes into account the inputs and the process; the catchment area of the school or hospital; how the education developed the individual; how well the treatment was tolerated. How can a league table show creativity or compassion ? The league tables provide figures – examination passes; degrees obtained; the number of operations; the number of deaths. How useful is this information ? When league tables are produced those that are at the bottom often instantly, and often rightly, voice their concerns that the information is misleading as it only reflects the outcomes and not the inputs. The hospitals, universities and schools that are situated in inner city deprived areas are unlikely to have similar results to those situated in opulent areas. The universities, such as the East London University, that have done badly in the league tables actively encourage students from the local area, who are non-typical students. The drop out rate is high so is it fair to compare what the University of East London is trying to achieve against Imperial College, London ? In industrial it would be similar to comparing the Smart car with a Rolls Royce Silver Cloud. Similarly comparing one hospital with another in terms of death rates provides an unbalanced picture. The catchment area is again all important, as well as the type of hospital (e.g. teaching, tertiary, district, general hospital) as they will have a different intake of patients, whose outcomes are likely to be very different. In order to compensate for these difference weighting factors are introduced to the data. Although statisticians would say that the weighting factors are sound, they change the data. In June 1999 the NHS Executive published its first information on clinical indicators. In order to compare ‘like’ with ‘like’ adjustments were made for age and geographical differences but not for the social and economic variation of a local population as it was felt that information on inequalities could be missed. (NHS Executive June 1999) So how valid are the data when someone has decided to adjust the data to allow for a comparison ? The solution of adjusting data has been developed to answer a problem with league tables, rather than addressing the issue that perhaps league tables are not always the best indicator to use to compare different organisations. In industry the product is tangible and the inputs are controlled – the raw materials to make the book, pair of scissors or grand piano will be specified and only accepted if they met the set criteria. In the service industries the price of the pizza or the hotel room is the same, whoever the customer is. The process is defined by cost factors and health and safety regulations, so whether a packet of frozen chips or a Rolls Royce are being produced the processes are governed by the same generalisable factors. In the public sector the input is a unique human being and the outcome can be very varied, dependent on both the input and the process. Is it right that the student from the wealthy background with educated and supportive parents should be processed in exactly the same way as a student from a poor background with no access to resources who has to work to support themselves and expected to obtain the same level of product ? In industry the aim is to make a profit. Profit can then be used to improve the standard of the product; pay better wages or provide the company directors with better perks. If the profits are low the company can consider reducing the standards of their products by using lower cost inputs, or changing the process in some way. In the public sector there are no profits to be ploughed back. If the mid year budget is not looking good there is no easy solution – the students still expect a learning experience, it is not possible to put fewer down the production line to save costs, or to change the standard of their product (degree). In the NHS up until the 1990’s demand was rising faster than supply as there was no additional resources available, this lead to rationing and long waiting lists. There are two differences with industry here. An industrial organisation would have profited from this extra demand, could have employed more staff and allowed for growth. The fact that the NHS lost patients because of the poor quality of the service did not effect staff employment, whereas an industrial organisation would probably not have survived the outcome of providing a poor quality service and staff would have been dismissed. In the commercial sector the customer chooses from a range of alternatives. The future of the business and its employees is dependant on providing a service that keeps its customers happy (Øvretveit) page 15. The difference between the sectors is that more customers means more profits for one sector, and resources more thinly spread in the other sector. In education (and health) the process is very important. Learning can be surface, deep or strategic. If the student managed to attain an outcome (pass an examination) by surface learning does this help the student long term ? If the patient is cured but the treatment was humiliating and extremely painful – does this count as a good outcome ? As with industry, the toy may look exciting and tantalising but if it breaks as soon as the child tries to use it because of the poor manufacturing (process) it is taken back to the shop to get the money back. In education, what happens when the product is bought because of the glossy brochure and the publicity claims, but the reality does not meet expectations. There are not enough staff, the books on the reading list are not in the library, the administration staff are rude, the place is dirty or the course does not come up to the expectations of the student (customer). But, this student has signed up for three years. Many students fear that the university staff may influence the type of product awarded – the degree, or the references provided when the student leaves. So how easy is it to ask for your money back in education ? There are many more factors to consider. The outcomes differ substantially between the sectors as well. For the industrial sector “the bottom line” is usually the predominating feature. In the public sector money is important, but usually because there is too little to go around. The outcome that the public sector wishes to achieve is an educated and healthy person, who can contribute to society, not a budget surplus at the end of the year. H&PE is being industrialised, along with all other elements of the public sector, but it is like squeezing a square peg into a round hole (figure 1)- there is an area that is similar – down the middle of the peg, but there is no way that the corners of the square peg or the curves of the circle are going to fit in, as the two are not entirely compatible. Perhaps there was too much freedom in the sense that there was too great a disparity between degrees from different universities and polytechnics, and the limits on the resources provided to the polytechnics. In economic terms money was wasted in much of the public sector because there was little or no accountability required. This element did require some regulation but, as so often happens, the pendulum swung too far and it went from no accountability to total accountability. This has brought its own problems that have not improved the delivery of education (or health). The level of bureaucracy has increased and so the professionals have to spend more of their time doing paper work. This would be fine if the number of professionals increased proportionally, but what has happened in many areas is that the extra bureaucracy is just added to the workload of individuals. My view on this is strengthened by my personal experience having worked in both the private and the public sector. I ran a small business for several years. Each month I had to ensure that there was enough money in the bank to pay the staff, the phone bills, the electricity etc and to look to expand the business, support annual pay rises for the staff and pay for the Director’s various homes across the world. I then took a job as a University Administrator, running a small department of which I was the budget holder. I quickly realised that money was wasted because staff were not required to be accountable and took easy and quick options. I saved 30% of the budget I was allocated in my first year by not wasting stationery, stopping international calls on phones that students had access to, ensuring that we received good print and stationery deals. The practice I encountered did not improve education, it wasted money that could have been spent on education, by using the money saved for better teaching resources, travel grants etc. So, I am in favour of using good business practices to run our public services, but what always has to be remembered is the core purpose – to educate, to improve health, not to save or make money. I often meet opposition when I say business practices should be utilised in academic circles. There is a perception that all in business is bad – and only interested in making profit and so cannot be applied to the public sector in any way. However, good businesses flourish, and make a profit by running efficiently, effectively and by having good staff who stay with the company. Calculate costs of poor quality (by not getting it right the first time). At the end of the day, the public sector will always need more money than it is provided by Government, it is therefore essential that it uses its money wisely. Lessons can be learnt from the industrial sector, but what works in industry will not always work in the public sector and caution must always be exercised. To some it appears that the introduction of quality by audit is the panacea for the public sector. I see this panacea having some bad side effects that may render it inefficacious if too much time is spent by professionals on audit and not enough time is spent by professionals on the area that they have expertise in.